Bradley is not your stock standard Sales Associate, with a fresh approach to the industry and previous experience in two different trades, he knows a thing or two about the importance of customer service. A background in the construction industry provided him with a unique insight in not only the ideas behind the many new developments taking place in the ever-growing Penrith area but also the ideas behind the more personal choices when it comes to purchasing your new home.This lead to Bradley’s passion for real estate and guiding people through the process of buying and selling. 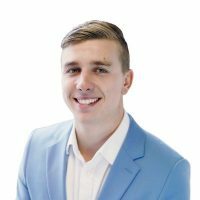 Bradley’s unique offering is his natural ability to understand the needs of his clients. With a strong work ethic and enthusiasm that will surpass any rival, he will drive hard to get the ultimate results for his clients. His work ethic will be his reason for success within Elders as he is motivated, enthusiastic, driven and above all, excited to give a quality experience to all those he deals with and give them the outstanding service clients of Elders have come to expect. Bradley received the Outstanding New Talent Elders award 2017. Would you like to speak to Bradley? If you’re thinking about renting or selling your property and you’d like a clearer picture of how much your property might be worth or want to have an informal chat about general property market trading conditions, Bradley will be happy to arrange a full market appraisal of your property.